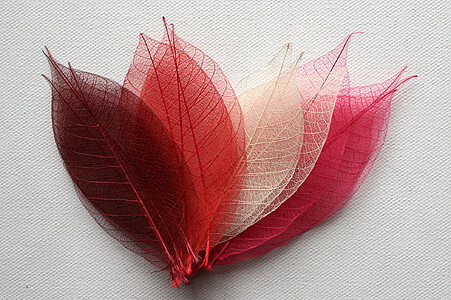 Skeleton Leaf - Just The Leaves supplies highly attractive and decorative leaves generally known as skeleton leaves. They are real leaves which have been harvested and processed by hand to a high standard in Thailand. We started trading in our present form in 2010 and are UK owned. Click here to learn more about how the leaves are made. We aim to enhance the quality of people's lives with beautiful and inspiring products made from the best quality materials. We also aim to help provide employment for less fortunate people in a developing country. We practise the fundamental principles of fair trade. We work closely with our partners in Thailand to encourage good working conditions and fair rates of pay. Respect for the environment and for local customs are also very important to us. Skeleton Leaf - Just The Leaves has established very close connections with some excellent small family-run businesses in Thailand. Hence we can offer you unparalleled access to new and exciting products as well as the option of customising products to your own special requirements. The team consists of Mike who is based in Chiang Mai, Thailand and Peter of Red Kite Services who lives in York in the UK. Peter maintains our stocks of leaves in York and it is from here that most of our leaf orders are dispatched. Click here for more information about the trees our skeleton leaves come from. No colour or extra coating is applied to the leaves once they have been skeletonised. These leaves are perfect for people who like natures own colours or those who wish to experiment with dying or coating the leaves themselves. 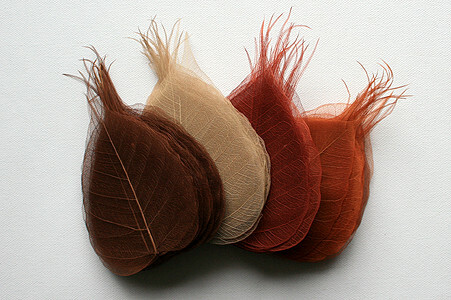 These leaves are dyed in a range of striking colours and can be used in many ways to create beautiful craft items. We sell packs of individual colours and also some very popular packs containing complementary colours such as our rainbow packs or the warm shades of brown packs. 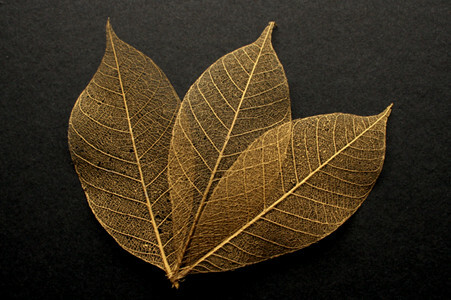 These are very beautiful leaves available in a range of exotic finishes to help add richness to your craft projects. They are also very popular with couples planning their weddings as they look precious without costing a fortune. Metallic leaves are available in gold, copper, silver and ivory finishes and are available in single colour packs and mixed packs. Here at Skeleton Leaf we are always looking at new products and new ways to use the leaves. We are always very interested to hear from you so please let us know your thoughts and ideas. We have also extended our Subtle Shades range to include Bodhi Tree Skeleton leaves for the first time. We have also added a new range of Rubber Tree Leaves that we've called colour palettes as they each contain 4 complementary colours. There are 5 products in our colour palettes range so you can choose a pack of coordinated colours for your project. Warm Palette - Red, Yellow, Brown & Orange. Spring Palette - Yellow Spring Green, Blue & Forest Green. Gothic Palette - Purple, Red, White & Black. The leaves look very delicate and are valued for their beauty. They are actually quite tough and can be used in many different ways. One way to enjoy the leaves is to simply throw them up in the air and watch them float to the floor. This method is very ably demonstrated by Peter and Sam who mail the leaves from their office in York.